Ontario Premier Kathleen Wynne, Ontario economic development chief Brad Duguid and FCA Canada CEO Reid Bigland, speaking during an announcement that FCA will receive funding from the Canadian province. TORONTO -- Ontario will provide up to $85.8 million Canadian ($66.5 million) to Fiat Chrysler Automobiles to help fund training and research. 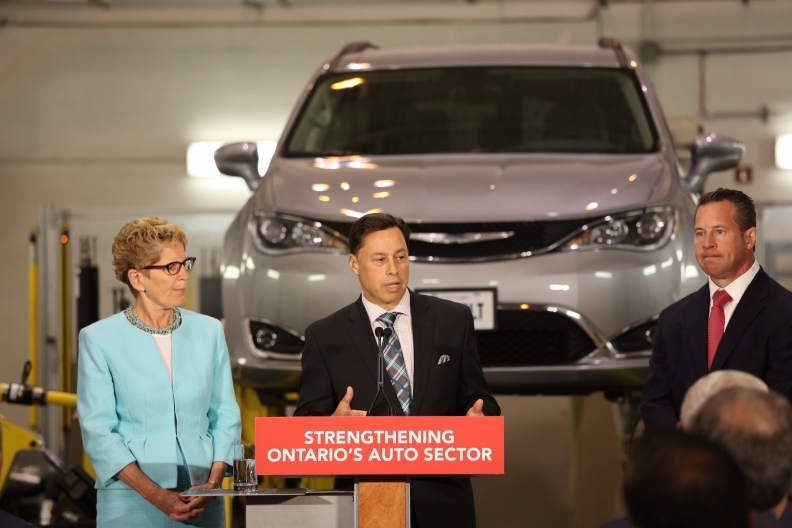 Ontario, home to much of Canada's auto industry, said the funding will support a joint FCA and University of Windsor research and development facility as well as training related to production of the Chrysler Pacifica minivan. The new minivan, assembled in Windsor, Ontario, will be available as a plug-in hybrid, a first for Chrysler in a high-volume vehicle. FCA failed to secure funding from the Canadian and Ontario governments before retooling its Windsor assembly plant to produce the Pacifica, publicly withdrawing an appeal for cash in 2014 after negotiations threatened to become an election issue in the province. Ontario Premier Kathleen Wynne, who announced the funding on Wednesday, referred to the episode as "the kerfuffle that we all went through." "We've been in conversation throughout that period, and I think there was an understanding that this partnership was important to both of us and we were going to find a way through it," said Wynne. FCA never said publicly how much it sought from Canadian governments. One media report said it was looking for $700 million Canadian, but FCA Canada chief Reid Bigland said he was not sure where that number came from. "It's never too little too late," Bigland said. "We're very proud of the support and grateful for the support that we receive from the province of Ontario.